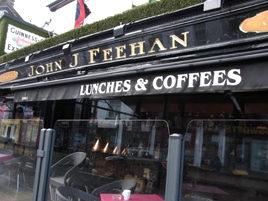 Fresh homemade soups, warm filled croissants and sandwiches, steak baguettes, crunchy warm salads served in a traditional Irish pub. Food served daily 12 – 6pm. Daily specials available. Wheelchair accessible, child friendly, take-away available, Groups welcome.